With so many movies set in Los Angeles, we reviewed a few favorites (Fast Times, Pulp Fiction, Boyz N the Hood, Clueless) that captured an interesting, funny or dark view of the city. Sheba says the latest book in J.K. Rowling’s series, dark and action-packed, leaves you eager for more. Teens say not to judge them for being Latino, wearing baggy pants or how much they weigh. Teresa’s foster family gave her a stable home and a chance for a better future. 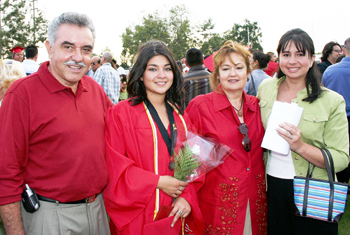 Teresa's foster family was proud to watch her graduate from Sierra Vista High School. They are, from left, her foster father Armando Gonzalez, Teresa, her foster mother Rosa Gonzalez, and her foster sister, Diana Medina. Before I entered the foster care system, I thought that I would walk in the same footsteps as my cousins. I would live in poverty and probably get pregnant at the age of 15 or be addicted to drugs. But everything changed when I met my foster parents. I experienced the support of a caring family and learned about college. At the age of 11, I moved into my foster parents’ home with two of my five siblings. It was my third foster home in one year. I thought, "Oh man, here we go again. I need to start all over again, new school, new friends and a new family." I was nervous, but as soon as we moved in, my foster dad made jokes. I saw that my brothers David and Ray were laughing and I relaxed. Their house was beautiful and I had my own room. My foster dad helped my brothers unpack and my foster mother helped me unpack,which is something my previous foster mothers did not do. This made me feel welcome. While my foster mother and I unpacked my clothes, she talked about her family and asked me questions about my family and what things I liked to do. It was important for me to live with a married couple because my parents never married, and it was something I wished they had done. I guess I thought that if they were married, there could have been more stability and maybe we could have been a closer family. Before we went into foster care, my siblings and I had been living with my grandmother. How come we didn’t live with my parents? Well, let me inform you. My mother was a druggie and my father was an alcoholic. What more do I have to say? My grandmother was our legal guardian, but she was EVIL! I grew up fearing her presence, even her name! She would beat us horribly, with spoons, cords, basically whatever object she spotted first. We had bruises every day. When I was 10, I told my attorney and immediately my siblings and I were taken away from my grandmother and placed in separate foster homes. My first two foster homes were nice, but they didn’t feel like home and I didn’t like being away from my siblings. When I moved in with my new foster parents, I was happy because I was going to live with my brothers again, and my three younger siblings were living a block away. My life began changing in a positive way as soon as I moved in. My foster dad told me that my only responsibility was my education. I had been getting Ds in almost every subject. I liked school, but when I didn’t understand something, I would easily give up. No one in my other foster homes helped me with my homework. My foster dad would sit with me every night to help me. After a few months, I became interested in school and became one of the top students in my class. My social worker decided to put me in therapy because I had been having nightmares about my grandmother killing me. There were nights when I couldn’t sleep because I feared going back to live with her. In therapy I opened up. I needed to let go of my fear of my grandmother. I needed to talk to someone about how lonely it felt without all my siblings living with me. I needed to talk about feeling like an outcast because I didn’t have a "normal life." I was worried about getting picked on or being the girl that students gossip about if they found out I was a "foster kid." My therapist was a great help. I learned how to express my feelings, and she made me feel safe because she would tell me that my grandmother was not going to harm me anymore. I had no contact with my grandmother and soon enough I stopped fearing her. My foster parents’ daughter, Diana, became a big part of my life. She lived nearby and taught at my elementary school, where I was in sixth grade. On weekends I would go to dinner and the movies with her and her friends and spend the night at her house. She would introduce me as her little sister. She got me interested in college. She would talk about her experience living in a residence hall, and how she met so many new people. She always told me that college was the best four years of her life. Diana became my idol and I loved her as my sister. My life felt stable for the first time since I entered foster care. I saw my siblings daily. My foster family was caring. I was doing well in therapy and in school. But after a year, things changed. When I first entered the foster care system I was too young to understand that it was possible for my siblings and I to be separated forever. At that moment I was happy that we were away from my grandmother. But in seventh grade, my siblings Miguel, Morena and Isabel—who had been living a block away—moved an hour away to a foster home in Victorville because it turned out that their foster mom had been physically abusing them. I was surprised and hurt by the news. I had grown to love my siblings’ foster mother as much as they did. She would hug them frequently and call them names like "sweetie," "honey" and sometimes "my little babies." Then one day a few months later my brother David stabbed his teacher with a pencil, so he was placed in a hospital. David had Attention Deficit Disorder, but I never understood his sickness until my foster father explained it to me. He told me that David was not always able to control his behavior. He said David was not a bad person, that he just had a problem and that he needed help. I was thankful that David was getting help, but at night I would cry myself to sleep because I knew that David felt lonely sleeping at the hospital. I felt bad that he had to be in the hospital with kids he didn’t even know and who were probably worse than him. I wished that it were me in the hospital instead of him so he wouldn’t have to go through such an awful experience. After six months, David came out of the hospital and was placed in a different foster home. When we had lived with my grandmother, I used to cook for, clean and bathe my siblings. When I was in school I would worry if they were OK. When I was at home I would worry about them getting fed or just being happy. I had been the mother figure, so it was hard when my siblings moved away. My older brother Ray and I saw David and my younger siblings twice a month for two hours at our foster care agency. When I missed them a lot I would call or write them letters. I would tell them how Ray and me were doing and how I was doing in school. I always said I missed them and loved them. Since Ray was the only one living with me, we became closer. We would hang out at school and after school we would play baseball with friends. Ray was my distraction. He was good at making me laugh. He would mock people on the television. He would also play Barbies with me so I wouldn’t have to play by myself. Sometimes I would forget that I lived in a foster home. My foster parents treated me as more than just a foster kid. They introduced me as their daughter, they never said something like "this is the girl we take care of." They felt like my real parents and Ray felt like my only sibling. But as I began high school, Ray began hanging out with the wrong crowd. He was not happy living with our foster parents. He thought they were too strict. He wanted to hang out with friends; he didn’t like that he couldn’t go out after seven o’clock. He began ditching school and smoking marijuana. My foster parents told him that if he didn’t start behaving, he was going to move into a group home, but Ray did not listen. He thought they were just saying that to scare him. When we least expected it, Ray got arrested for ditching and possession of marijuana. My foster parents decided they couldn’t handle him and put him in a group home. To make my freshman year worse, I found out that my sisters Morena and Isabel were getting adopted by a military family and moving to Germany. When I got off the phone, my foster mother knew something was wrong. I didn’t want to talk about it, but she repeated "tell me, tell me." So I told her. She made me feel better by saying that it would still be possible to keep in touch with them even though they were far away. For the next few weeks, I cried constantly, but my foster parents were there for me. They said getting adopted was better for my sisters because they would be in a stable home. Sometimes I would be in my room crying and my foster dad would sit with me and talk. He would help me forget by changing the subject and talking about college. He would tell me that even though my sisters got adopted, they are still my sisters. In the end they moved to Texas instead of Germany. I was relieved. My younger brother Miguel also got adopted by a different family and moved to Utah. It was hard for me to accept that my siblings got adopted. I knew that we were all going to have separate lives. I lost the hope that one day we would all become a whole family again. Later that year, my foster sister Diana went through a divorce and became depressed. I spent every weekend with her and we became really close. We would talk and I would tell her I knew how she felt. Losing her husband was like losing my brothers and sisters. As we talked, it became easier for her to accept it. I saw how she was able to move on. She learned that she could live on her own, that she was a strong person and that she could be happy without a husband. That was her toughest experience, but because of her strength and independence, she survived. That experience taught me a lot. I learned that if you believe in yourself, you can get on your feet again even if you have fallen hard. I realized that I shouldn’t focus on the problems that my family had or being in foster care, but on how I could improve my life by staying out of trouble and going to college and having a career. My foster family believes in me. They have always told me that I am a smart young lady. They tell me that I am strong and they admire me for all my accomplishments. In June, I graduated from high school with honors and am now attending Whittier College. I am majoring in Spanish and education to become a Spanish teacher. I want to become better than my grandmother and prove to her that I’m not a "worthless girl," like she once said I was. When I have time, I will spend weekends with my foster family. They say I can come home anytime. I still talk to my siblings. David just started high school and loves it. My sisters are starting junior high, and Ray has his own apartment and is attending junior college. My brother Miguel is the one I have least contact with. I get emotional when I speak with him because I forget that he is not a baby anymore. He reminds me that they are all growing up and I was not there every day to see that. We have all found stability and families that love us. I guess I would say that we are all lucky. We have our biological family and the families we live with now. I used to think that family was only your brothers and sisters, mom and dad. But now I know that your family is the people who are there for you in good times and bad times. I never thought that when I moved into my third foster home, I was going to gain a family and find hope for the future.